Scar:" well I shall never be king, and you shall never see the light off another day hmmm ado." Zazu: "tell you not to play with your food?" Scar: (sighs) "What do you want?" Zazu:" I'm here to tell you....."
Zazu : "... that king Mufasa is on his way. So you'd better ..."
Zazu:"have a good excuse for missing the ceremony this morning. He's as mad as a..."
Zazu : " hippo with a hernia "
Zazu : "Now Scar, don't look at me that way..."
Zazu: "(Speaking from Scar's mouth) Impeccable timing, your majesty. Scar "if it isn't my big brother descending from on high to mingle with the commoners." and I didn't see you at the presentation of Simba. Scar (sarcastically) "that was today,I feel simply awful,(runs nails down the wall) must have slipped my mind." Zazu: "....as slippery as your mind is, as the king's brother, you should have been first in line!" Mufasa "that "hair ball" is my son and your future king." Mufasa "back on me scar." Scar "oh no Mufasa perhaps you shouldn't turn your back on me." Scar "....I'm at the shallow end of the gene pool." Mufasa"what am I going to do with him?" Zazu: "He'd make a very handsome throw rug." Zazu "And just think,when ever he gets dirty..."
Zazu : "..... you could take him out and BEAT him. " (Skips to rafiki painting on the wall) Rafiki "Simba,hehe." Sarabi : (Over Simba's endless noise of "Dad"s, sleepily) "Your son... is awake..."
"Before the sun rises, he's your son." Simba: "Dad! Come on, Dad!" (pull on Mufasa's ear then flies back and crashes) "Whoa!" Mufasa "Before sunrise he's your son." Mufasa: (Seeing his son's impatience) "Okay, okay. I'm up. I'm up." Mufasa and Simba are sitting on top of pride rock looking at the sunrise. 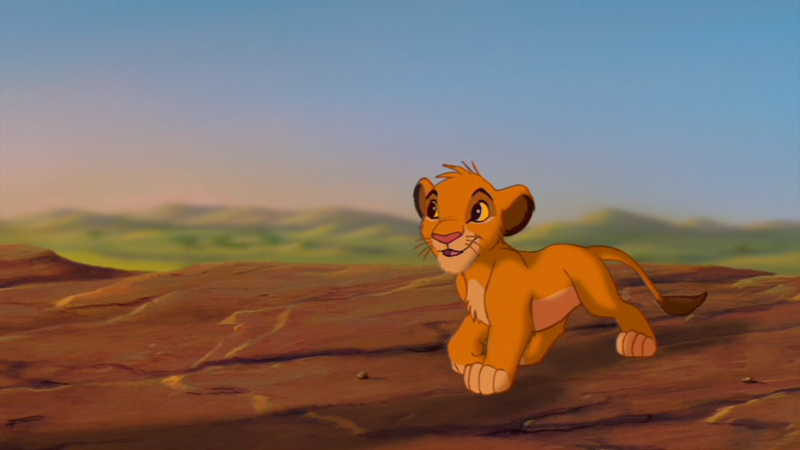 ....Look, Simba. Everything the light touches is our kingdom. " Mufasa "the sun. One day Simba the sun will set on my time here and will rise with you as the new king." ..And this will all be mine? " Simba "what about that shadowy place?" Mufasa "that's beyond our borders,you must never go there Simba." ....a king can do whatever he wants." Mufasa: "Oh, there's more to being king than... getting your way all the time." Simba " (amazed) there's more!" Mufasa "everything you see exists together in a delicate balance,as king you need to understand that balance and respect all the creatures,from the crawling ant to the leaping antelope." Simba "but dad don't we eat the antelope?" Mufasa "yes Simba but let me explain...when we die are bodies become the grass and the antelope EAT the grass and so we are all connected in the great circle of life." Zazu: "Checking for the morning report?" Zazu "well...the buzz from the bees is that the leopards are in a bit of a spot." Mufasa " Oh really?...What are you doing son?" Mufasa: " Let the old pro show you how it's done." Zazu: "...The tick birds are pecking on the elephants. I told the elephants to forget it, but they can't..."
Mufasa "...would you turn around?" Zazu "yes sire. (The cheetahs are hard up,but as I always say cheetahs never prosper.)" Mufasa "stay low to the ground." .....stay low to the ground, right... yeah..."
Zazu: " (Realizing something is amiss) What going on? " 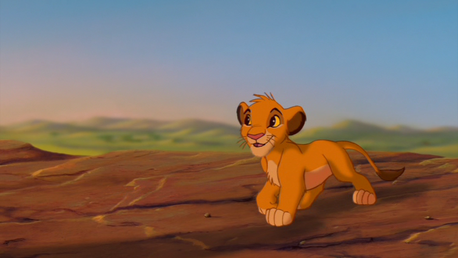 Mufasa: " A pouncing lesson. " Zazu: "That's very good. pouncing....POUNCING! Oh, no! Sir, You can't be serious? This is so humiliating." Mufasa: "Try not to make a sound." Zazu: "What are you telling him, Mufasa?...Mufasa? Simba? Mr. Gopher (pops out of the ground right below Zazu) " Zazu"
Mr. Gopher "sir news from the underground." Zazu "sire hyenas! In the pride lands!" Mufasa: " Zazu, take Simba home." Simba: "Oh, Dad can I come?"